Originally, Vandelay and I were hoping to check out Daddy's Delight Pizza for some eats. No, we didn't drive all the way to Richmond for some slice pizza. We are nuts, but not completely out of our minds. If there was the case, we would've rode up in a scooter (a la Dumb & Dumber) right in the middle of Richmond rush hour. Despite the descriptive name, the place actually serves up Persian food, in particular, kebabs. Well, it was a fail as the place was not open yet. 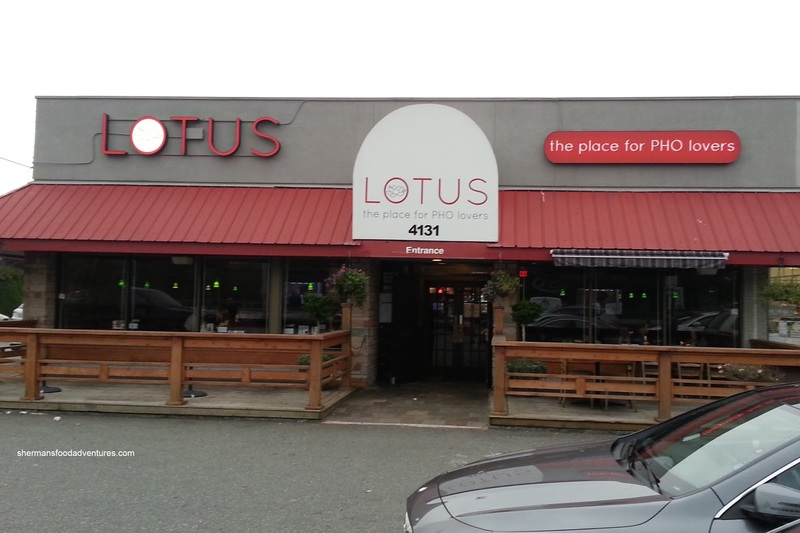 So as a consolation, we went across the street to Lotus for some Pho. From the menu, the Butter Garlic Fried Chicken Wings sounded appetizing, so we gave it a go. Unfortunately, the wings were lacking impact and overall flavour where all I could taste was a fading background garlickiness. There needed to be more salt and yes, more garlic for these wings to taste good. 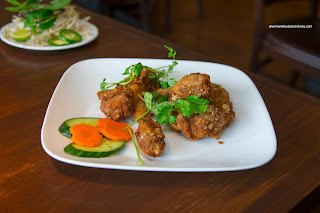 However, the wings themselves were fried crunchy with a relatively moist interior. 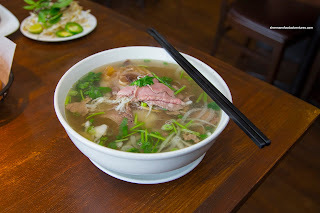 As for the Pho, it was a hearty portion, but the meats were somewhat meager, albeit tender. The noodles were toothsome and plentiful, so it would be assumed the whole thing was good right? Not really because the soup was far too sweet in our opinion. Although clean-tasting, it wasn't balanced. Lastly, we had the Bo Kho with a banh mi. Although the broth was thin and trending towards the sweeter side, it did exhibit body and impact. 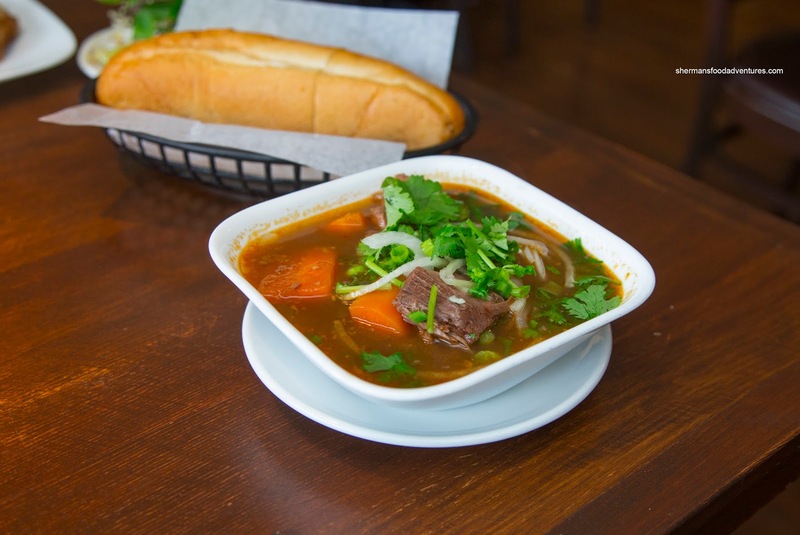 The chunks of brisket were on point being fatty, buttery and melt-in-our-mouths tender. The baguette was nicely toasted being crusty outside and airy inside. This was the best dish of the 3 we tried. Despite this, the other 2 were "alright" but, didn't encourage us to come back and try more dishes. On the other hand, the stuff was decent enough for someone looking for a quick meal. 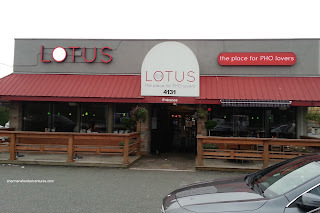 LOTUS eh ? I should go here to eat then. I looks pretty nice inside. I want to try out their food but I never seem to make it past the chicken place next door.